"The Fields," Bahrain 40 cm x 50 cm. Studies in oil of Manama, Bahrain by Christine Olga Smith, https://www.behance.net/gallery/18427247/Paintings-II-Bahrain. 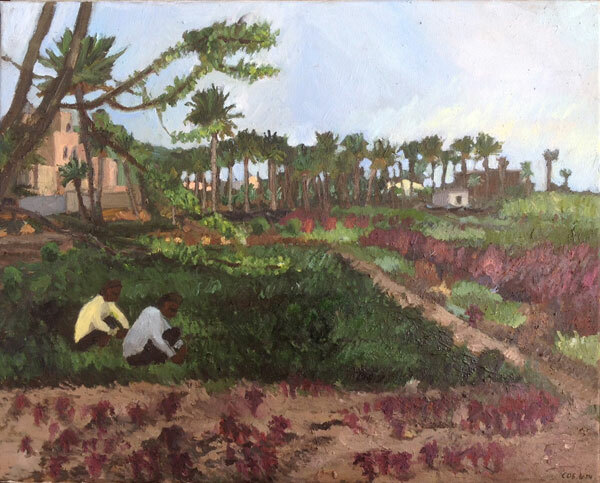 This painting shows workers harvesting lettuces in one of the plots of land near an oasis close to our house in Bahrain. It is where workers who live on the land harvest greens and dates. In February of last year, AramcoExPats featured one of the most enthusiastic annuitants we’ve had the honor of writing about in our 16 years of publishing, Greek-born Iro Smith. Iro’s great Arabian adventure began in 1982 when she and her husband Ron, a civil engineer with the company, first moved to Dhahran. There they lived and worked for 27 years, raising three children along the way—Christine, Lorraine, and Andrew. Iro is originally from the North Aegean coastal city of Kavala, Greece, 90 miles east of Thessaloníki and 120 miles west of the Turkish border. Christine, meanwhile, a bona fide Aramco Brat, currently makes her home in Glyfada, Greece, a seaside suburb of Athens 10 miles south of the city center. Exhibiting a powerful passion for life akin to that of her mother’s, Christine has blossomed into a multi-talented artist. She carries with her to this day many fond memories of Arabia, two of her favorites being the smile and turban worn by their gardener and the french fries served at the Al-Diwan snack bar. “Mostly,” she told AXP, “I liked writing in our journals in first grade at the Dhahran Elementary School, where I first wrote that my dream was to become an artist.” Fortunately for Christine and the world, that dream came true. "Cell Transformation," Digital Draft 29 x 42 cm, Adobe Photoshop & Illustrator, 2018 by Christine Olga Smith. This image is a composite of two separate subjects. The first being pink free dots resembling petals or drops in motion, inspired by Japanese Kimono patterns but also a reference to the way cancer cells look when magnified. Christine first established her business, Blue Fig Art, “in 2008 in a small coastal town in the southern part of Greece called Porto Heli, an area rich in history and nature. The company started out as an art gallery and grew into a multi-functional art space used for exhibits and art workshops while serving as well as a studio.” Today Blue Fig has an office in Glyfada in addition to its space in Porto Heli. Additional information on the project can be found in Christine’s online portfolio as well as on her Fresh Arts Sponsorship page. 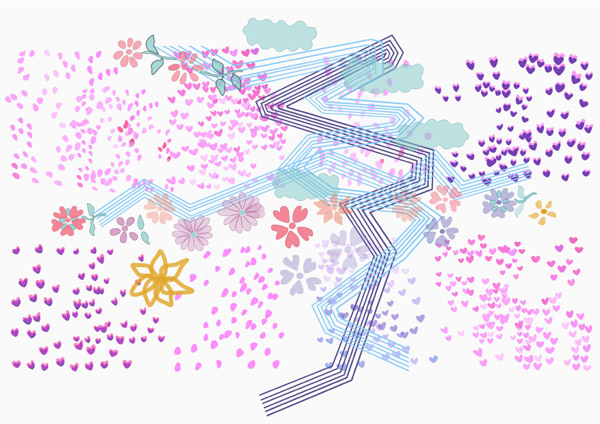 Interested readers can help fund the Healing Illustrations project through that organization’s cultural fiscal sponsorship program. Click here. Readers can communicate with Christine Olga Smith via her email: [email protected]. Her current address in Greece is Metaxa 46 A, Glyfada, Attica 16674, Greece. When not creating more artistic treasures, Christine finds time to pursue diving, ballet dancing, and attending church. Like her mother Iro, she is filled with a passion for life, and with a love for and appreciation of the wonders of Saudi Arabia and the Saudi people. "Shahada," 1 of 8 posters from "Healing Illustrations", (draft 2), 42 x 29 cm, tools: Adobe Photoshop, 2018, by Christine Olga Smith. 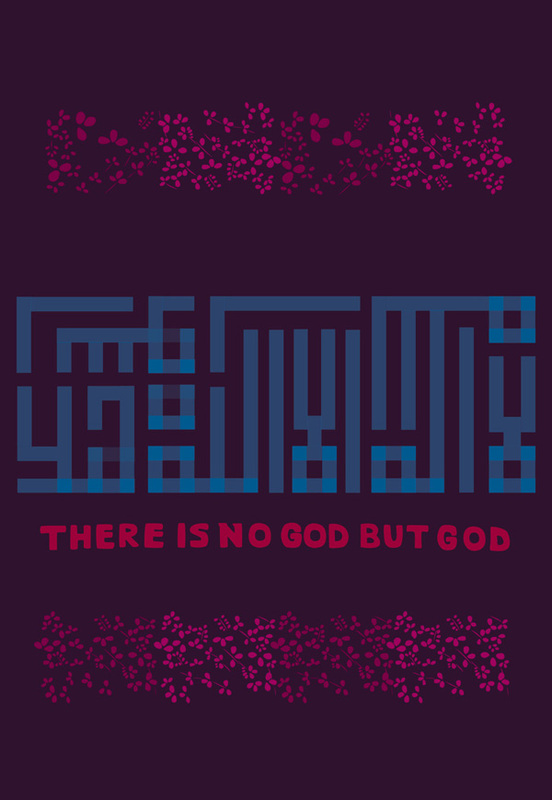 The Shahada in Arabic Kufic-style calligraphy, https://en.m.wikipedia.org/wiki/Shahada. This poster may be purchased; proceeds go towards my public art project, Healing Illustrations. Fair Market Value: $20. Donation: $70.